Get your dancing shoes on, Sheff’s sauciest midweek activity relaunches Wednesday 21st Feb.
Back due to popular demand, the new free salsa classes will kick off at 9pm with renowned instructor Freddie Garland, where you can learn to get in step with basic and advanced salsa dancing before heading downstairs to freestyle in a salsa party from 10pm. Entry is free all night and so is the class, so you’ll have a bit of dough left for some of Bloo 88’s famous cocktails to loosen you up, it’s happy hour till 9.30 including 2 for £10 on cocktails. And if you need some fuel beforehand, it’s 2 for 1 on all 12″ pizzas til 9pm. 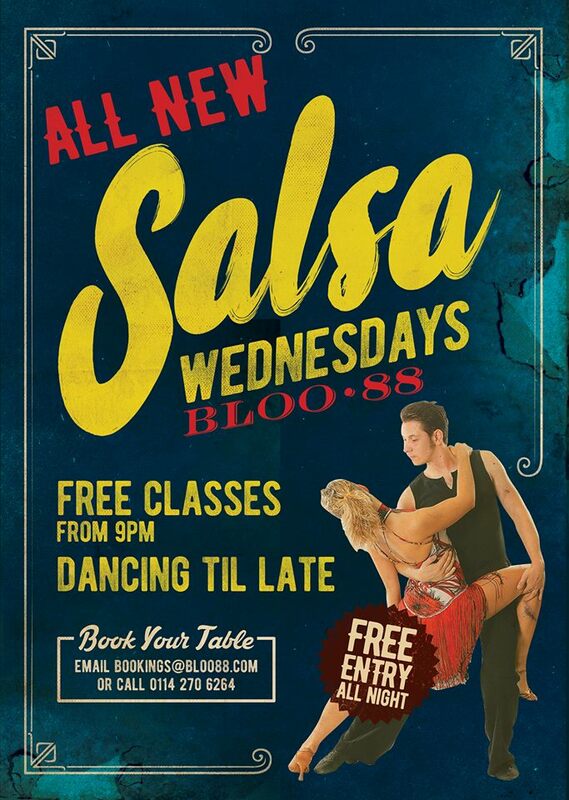 To book your table email bookings@bloo88.com or call 0114 270 6264.